Here are this week’s favorites… very excited to see some holiday themed shoots! Bundle up this weekend, it’s supposed to be super chilly! Categories: What's New | Tags: babies, families, halloween, kids, toddlers, weeklypics | Permalink. Here are the editor’s favorites from each studio in the past week! Fall leaves, snowflakes, and blocks are just a few of the portrait accents we have available in the studios. Soon we’ll attempt to write a post about ALL of them, so stay tuned! Spooks of the week: Happy Halloween! Today, I wanted to share some of the most adorable Halloween costumes captured recently at Portrait Simple studios across the region, in lieu of the usual “shoot of the week.” If you have a portrait session coming up, be sure & bring in your own costumes for a few shots! Categories: What's New | Tags: christmas portraits, costumes, halloween, holiday portraits, holidays | Permalink. So much is going on! Our holiday season has officially begun with our September card sale, Smile for a Cure voting is just around the bend, we’re re-opening our Warwick studio, and we’re getting our new Emerald Square studio ready for its first holiday season. The boy’s parents had the idea of bringing in the guitar; they must have known he was a natural born star. Wouldn’t “Risky Business” be adorable for Halloween? Speaking of which, it’s a great idea to bring in your costumes and include a few shots in your October portrait sessions. 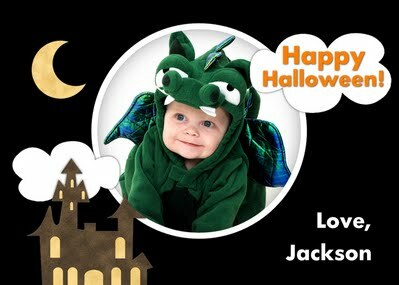 We offer these cute little Halloween cards, printed immediately, for $9.95 per set. I can’t wait to see the costumes this year! Lots more to come, so stay tuned. Categories: What's New | Tags: halloween, rockingham, shoot of the week, toddlers | Permalink. To read more, visit our customer raves section. Thanks for the shout-outs! Categories: What's New | Tags: costumes, halloween, testimonials | Permalink.